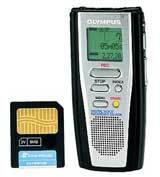 Voice recording and downloading your speech files has never been easier, thanks to the DS-2000 Professional Digital Voice Recorder. Includes 16MB SmartMedia card for over 5 hours of recording time (LP mode). Can record up to 22 hours of high-quality DSS audio (using a 64MB SmartMedia card). Can store recordings in up to three separate folders. Folders can be assigned a name of up to 8 characters. Store up to 199 messages per folder.